آلیس پیرس (انگلیسی: Alice Pearce؛ ۱۶ اکتبر ۱۹۱۷ – ۳ مارس ۱۹۶۶(1966-03-03)) یک هنرپیشه، و خواننده اهل ایالات متحده آمریکا بود. از فیلم‌های او می‌توان به «در جستجوی تفریحات شهری» و «جنس مخالف» اشاره کرد. مشارکت‌کنندگان ویکی‌پدیا. «Alice Pearce». در دانشنامهٔ ویکی‌پدیای انگلیسی، بازبینی‌شده در ۱۴ اوت ۲۰۱۴. «Alice Pearce». بازبینی‌شده در ۱۴ اوت ۲۰۱۴. در ویکی‌انبار پرونده‌هایی دربارهٔ آلیس پیرس موجود است. Alice Pearce (October 16, 1917 – March 3, 1966) was an American actress. She was brought to Hollywood by Gene Kelly to reprise her Broadway performance in the film version of On the Town (1949). Pearce played comedic supporting roles in several films, before being cast as nosy neighbor Gladys Kravitz in the television sitcom Bewitched in 1964. She won the Primetime Emmy Award for Outstanding Supporting Actress in a Comedy Series posthumously after the second season of the series. She died from ovarian cancer in 1966. Pearce was born in New York City, the only child of Margaret Clark and Robert E. Pearce. Her father was a foreign banking specialist, and her family moved to Europe when she was 18 months old. They lived in Brussels, Antwerp, Rome, and Paris. At age nine, she fell off a swing after losing her grip and landed on her chin. This left her with an undeveloped chin. She returned to the United States as a teenager, and boarded at the Masters School in Dobbs Ferry, New York. She graduated from Sarah Lawrence College in 1940, with a degree in drama. She began working in nightclubs as a comedian and was cast in the original Broadway production of On the Town (1944–1946). Gene Kelly was so impressed by her that she became the only cast member to be included in the film version in 1949. 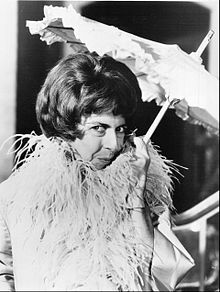 Her comedic performance was well received by critics and public alike, and she was given her own television variety show, The Alice Pearce Show. More movie roles followed, and she made appearances on Broadway, where she met her husband, director Paul Davis, during a production of Bells Are Ringing. During the 1953–1954 television season, Pearce was seen regularly on ABC's Jamie, which starred Brandon deWilde. In 1964, Pearce was originally approached to play the part of Grandmama in the ABC television comedy series The Addams Family. She turned down the part, which went to veteran actress Blossom Rock. In 1964, Pearce joined the cast of Bewitched as the nagging and nosy neighbor Gladys Kravitz. Pearce's scenes were almost entirely reactions to the witchcraft she had witnessed at the house across the street. Her hysterical accusations against Samantha, played by Elizabeth Montgomery, and the disbelief of her husband Abner (George Tobias), provided a common thread through many of the series' early episodes. She played the role until her death in 1966, and was replaced by Sandra Gould. Pearce was posthumously awarded an Emmy Award for this role. Her husband accepted the award on her behalf. Pearce was married twice; Her 1948 marriage to composer John Rox lasted until his death in 1957. In 1964, she married stage manager Paul Davis, with whom she remained until her death. Pearce had no children. Pearce was a good friend of actor and photographer Cris Alexander. When Alexander was working on the illustrations for Patrick Dennis's bestseller Little Me he asked Pearce to appear in the work as Winnie, the reform school friend of Belle Poitrine, the biography's subject. She also appeared as several characters in Dennis' and Alexander's later project, First Lady: My Thirty Days at the White House. Pearce was diagnosed with terminal cancer before Bewitched began. She kept her illness a secret, although her rapid weight loss was quite evident during the second season of the sitcom. She died from ovarian cancer toward the end of the second year of Bewitched at the age of 48. Pearce was cremated and her ashes were scattered at sea. 1951 Lux Video Theatre Nina Episode: "Dames Are Poison"
1953 The Motorola Television Hour Hagga Episode: "The Thirteen Clocks"
1959 The Real McCoys Emmy Episode: "Work No More, My Lady"
1961 The Twilight Zone Mrs. Nielsen Episode: "Static"
1963 The Donna Reed Show Adele Collins Episode: "A Touch of Glamour"
1963 The Alfred Hitchcock Hour Haila French Episode: "Good-Bye George"
1964 Hazel Miss Elsie Episode: "Hot Potato ala Hazel"
1967 Vacation Playhouse Music Teacher Episode: "My Boy Googie"
^ a b "Alice Pearce". TV Land. Archived from the original on November 12, 2013. Retrieved November 7, 2015. ^ a b c Misurell, Ed (May 29, 1965). "Her Life Is Filled with Sorcery". Daily American. p. 13. Retrieved July 6, 2017 – via Newspapers.com. ^ a b "Finally the Center of Attention". TV Guide. 13 (52): 13–14. December 25–31, 1965. ISSN 0039-8543. ^ a b Shearer, Lloyd (October 11, 1964). "Alice Pearce: The Chinless Wonder". Reading Eagle. Retrieved September 27, 2014. ^ "Alice Pearce". Daytona Beach Morning Journal. Associated Press. March 4, 1966. Retrieved September 27, 2014. ^ Green, Stanley (1999). Hollywood Musicals Year by Year. Hal Leonard Corporation. p. 156. ISBN 978-0-634-00765-1. Retrieved October 3, 2015. ^ a b c Terrace, Vincent (November 6, 2008). Encyclopedia of Television Shows, 1925 through 2010 (2 ed.). McFarland & Company. pp. 25, 252, 525. ISBN 978-0-7864-8641-0. Retrieved October 3, 2015. ^ "Sandra Gould Played Gladys Kravitz". Milwaukee Journal Sentinel. July 28, 1999. Retrieved September 27, 2014. ^ Handsaker, Gene (May 23, 1966). "Miss Stanwyck, Cosby Are Top Performers". Nashua Telegraph. Associated Press. Retrieved September 28, 2014. ^ "Terminal Illness". The Gettysburg Times. March 19, 1966. Retrieved September 28, 2014. ^ Manners, Dorothy (March 9, 1966). "Alice Pearce Chose Happiness". The Indianapolis Star. p. 23. Retrieved June 21, 2018 – via Newspapers.com. ^ Leszczak, Bob (November 2, 2012). Single Season Sitcoms, 1948–1979: A Complete Guide. McFarland & Company. p. 179. ISBN 978-0-7864-9305-0. Retrieved October 3, 2015. Wikimedia Commons has media related to Alice Pearce. "Alice Pearce". Find a Grave. Retrieved September 14, 2010. این صفحه آخرین‌بار در ‏۱۰ فوریهٔ ۲۰۱۹ ساعت ‏۲۰:۵۱ ویرایش شده‌است.